Persimmons have long been cherished in Asia, where many species are native. Now these pumpkin-colored orbs are getting more popular—and more available—in the United States. Their culinary properties vary from one variety to another, however, making it difficult for the uninitiated to appreciate them. Still, it’s worth learning how to choose and serve this delicious, healthy fruit. Persimmons come from several deciduous tree species in the genus Diospyros. The fruits are actually large berries, and they ripen from October through November. They are often categorized as either astringent (high in tannins) or nonastringent (lower in tannins). The North American native species, D. virginiana, is astringent, and if you’ve ever bitten into one picked before frost, you would be hesitant to try one again! This soft-fleshed fruit needs to stay on the tree until the temperature drops below freezing in order for its sugars to concentrate. Only then is it edible for humans and the many animals that eat and disperse its seed. Though American persimmons are sometimes available, Asian persimmons are still more common commercially. Many are cultivars of D. kaki, which may or may not be astringent. One common cultivar is ‘Hachiya’, which is an astringent variety. 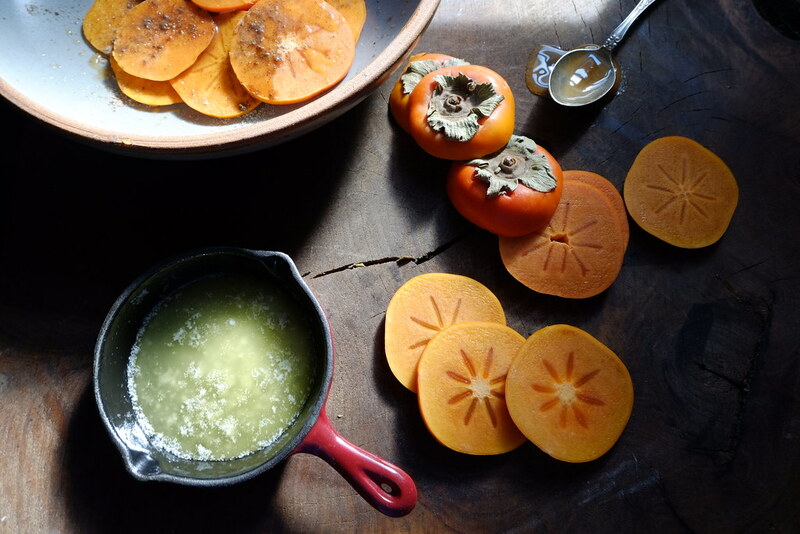 You will most likely find 'Hachiya' persimmons at markets with firm flesh. Let them ripen at room temperature until they are almost squishy soft. Then they will be spicy-sweet and may be peeled and puréed for spooning over ice cream, swirling into yogurt, or spreading as a raw, uncooked jam on toast. ‘Hachiya’ persimmons are also beautifully preserved in the Japanese tradition of hoshigaki, in which they are peeled, suspended by a string, and massaged daily until they shrivel and crystalize into sweet chewy treats. 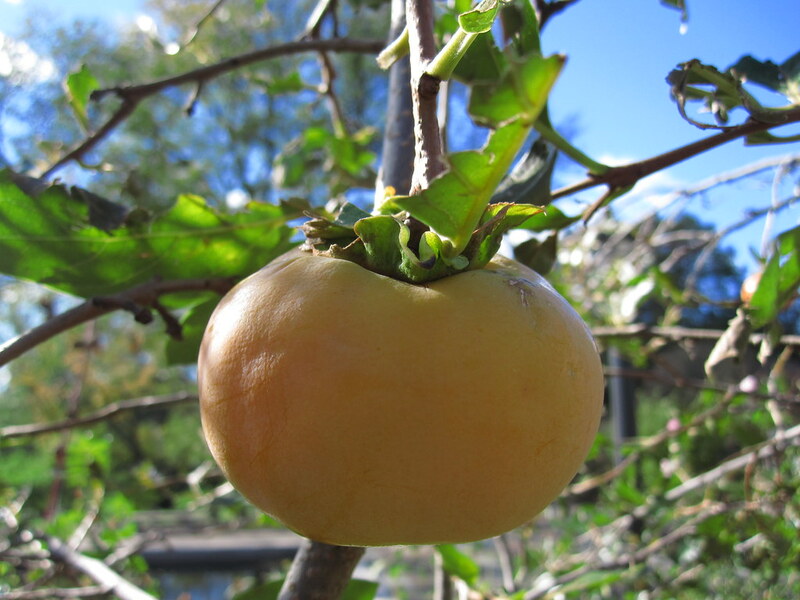 The nonastringent ‘Fuyu’, another D. kaki cultivar, has an appearance not unlike a squat tomato, and as with many persimmons, it sports a persistent calyx (the ring of sepals that once protected the flower). BBG’s Perennial Border and Herb Garden both contain specimens of ‘Fuyu’. 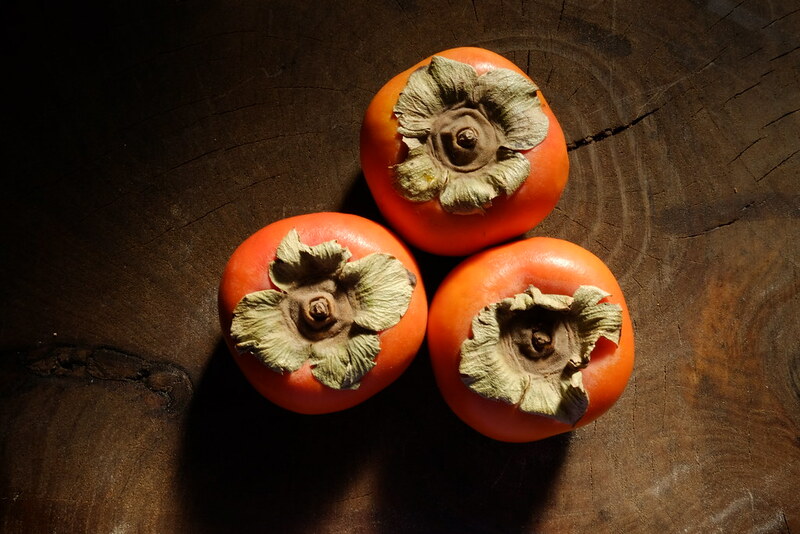 Unlike the ‘Hachiya’, the ‘Fuyu’ persimmon is best enjoyed while its flesh is still firm. It can be sliced and eaten raw in salads, baked into pies or galettes, or roasted, as in the tasty recipe below. Roasting fruit only brings out its natural sweetness and this recipe is no exception. With the addition of a bit of honey and spices, these buttery persimmons are excellent served on toast. Another option: serve on top of a bowl of vanilla ice cream with a ginger snap on the side. Preheat your oven to 425°F. Discard the calyx and stem of the persimmons, and using a sharp knife or a mandoline, slice them into 1/8- to 1/4-inch rounds. Place in a large bowl and drizzle with the butter, honey, orange juice, and vanilla. Sprinkle the spices and salt evenly over the persimmon rounds and toss with your hands until they are evenly coated with the sweet, buttery spice mix. Line a sheet pan with parchment and lay each slice flat onto the pan. Roast in the oven for 8-10 minutes or until the edges begin to slightly curl and caramelize. 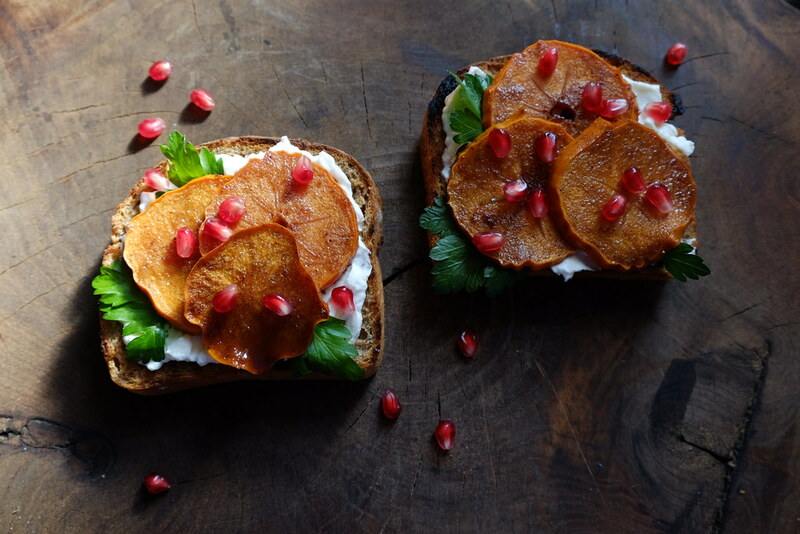 Remove and serve on buttered toast spread with labneh (yogurt cheese) or cream cheese and sprinkled with parsley and fresh pomegranate arils. Asian persimmons (Diospyros kaki 'Fuyu') with calyxes still attached. Photo by Sarah Owens. Sliced persimmons, ready for roasting. Photo by Sarah Owens. Roasted persimmons on toast. Photo by Sarah Owens. Japanese persimmon (Diospyros kaki 'Fuyu') ripens in the Perennial Border. Photo by Rebecca Bullene.